With Lending Club Disgraced, FinTech Industry Looks For Lessons : All Tech Considered Lending Club, a leader in the peer-to-peer marketplace, is mired in scandal. The finance technology industry, known as FinTech, is dissecting what it means for online lending. 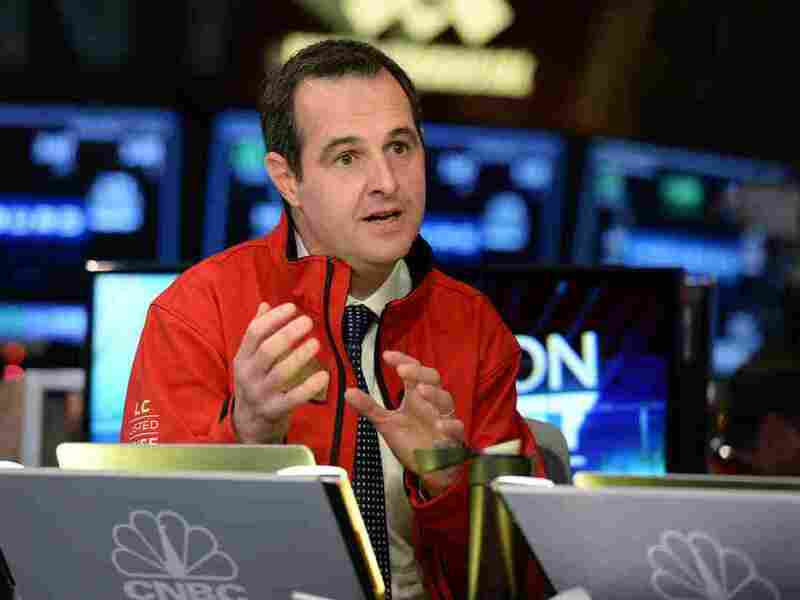 Lending Club founder and then-CEO Renaud Laplanche is interviewed on TV after his company's initial public offering on the New York Stock Exchange in December 2014 in New York. Laplanche resigned in May 2016. Lending Club — one of the first companies to directly connect borrowers and investors online — is in boiling-hot water. Investors were lied to, and the CEO resigned. Industry insiders are disputing what the real lessons of the scandal are. The scandal started with a very big no-no: Employees of Lending Club went into the company database and doctored loan applications to make them look more appealing to investors. "Once the loan application has been made, that data is sacred," says Peter Renton. "That data should never be tampered with, never should be touched in any way." Renton, who helped found the popular industry conference LendIt, is a mover and shaker in the online-lending world, as well as an investor. In the case of Lending Club, that means he puts his own money into the loans that go out to borrowers. And he doesn't want to be lied to. "That's been the most damning thing — if investors can't trust what Lending Club is telling them about the loans that they're investing in, then they don't want to invest," he says. Still, Renton is not pulling out. While Lending Club has problems, he says, so does the entire finance technology, or "FinTech," industry. When FinTech first rose up to challenge big banks and give consumers more choice, the startups paid more attention to the tech part — making nice, easy-to-use apps. Now with Lending Club's fall from grace, "that thinking has completely changed in the last month," Renton says. "These companies now say, 'We are in the finance business first and foremost.' "
Sounds like a pretty obvious revelation — they are dealing with billions of dollars, not Facebook posts or virtual pets — but Renton says the industry now recognizes it needs oversight, like banks have. "If you don't have oversight, so the regulation is actually being implemented and adhered to, then there's a problem," he says. Lending Club discovered the employee misconduct internally and disclosed it. The company is now under investigation by New York's bank regulator and the U.S. Justice Department. A smaller rival of Lending Club has a different takeaway. According to Al Goldstein, CEO of Chicago-based Avant, the problem is the business model itself: Lending Club makes money by being a middleman — pairing investors and borrowers. If Lending Club had its own money in it — if the company weren't just a platform for other people's money — he says it would be a lot more rigorous at managing that money. "If the online lending companies actually have skin in the game, and were holding loans, they would have substantially more at stake to make sure that their processes were sound," Goldstein says. "And you wouldn't have the same kind of issues that we've seen happen." Removing those stakes, he says, also makes it easier for a company to justify bending rules to hit ambitious targets. Those aren't just Goldstein's opinions, they're his business model. He says Avant keeps roughly half the loans it originates on its own balance sheet, and sells the other half to investors. "We actually sell and hold a random allocation, so that the loans we sell look like the loans we hold, so incentives are aligned." According to Orchard, a startup that bids on and tracks loans, investor appetite for online lending is down. Co-founder David Snitkof expects to see loan origination drop sharply in the second quarter of this fiscal year, perhaps to just two-thirds of what was seen in the first quarter. Lending Club announced this week it's getting stricter about the loans it makes, and setting higher interest rates. It's not because borrowers did something wrong — there was no spike in defaults or missed payments — but with investors turned off, the company says it needs to court them with higher returns.